As a Movement of and for young people the YCW uses the inductive method of analysis See, Judge, Act, Review. Based on the format of experiential learning members are encouraged to enquire into the situations that affect them on a daily basis and plan and organise specific actions to bring about a positive change. This inductive method of analysis begins with the everyday lived experience of young people, the issues, problems and challenges that face them every day of the week. 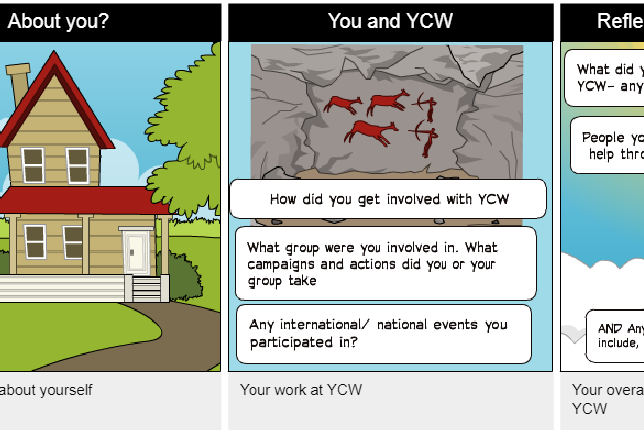 The YCW method challenges young people to become aware of the reality of their particular situation and that of those around them, in their work place, community and parish, school, home and in society. During the YCW meeting members of the group help one another to explore the details of these events/facts/situations to gain a greater understanding and to assess the causes and consequences of what has happened. How did the situation affect those involved? What was said? Why did this happen? Why did people act as they did? What are the causes and consequences of what happened? The group discusses the rights and wrongs relevant to the situations and experiences shared, taking note of what has been discovered in the “See” part. Should this situation be happening? Do you think this is right? What makes it right or wrong? Is there anything that we can do to change the situation? The group discusses possible ways of responding to the situations described in the “See” part. Actions can be carried out by individuals within the group or by the group as a whole. Is there anything you/we can do, no matter how small, to improve the situation? Is there anything more we need to find out? Is there anyone we can influence to improve things? What action are we going to take? More often it’s the process we go through on the way to action that’s important. It is always essential to review our actions to see if it was success and what we learned from working together. Did we carry out the action? What difficulties did we come up against? What effect did our action have on us and on others? What did we learn from the action? How did we feel before? During ? After? Is there any further action we can take? These cards can be used to assist you in dealing with any issues or situations in your daily life or help you in getting to grips with the Gospel message and how it relates to your life. Next time you have an issue of concern which needs addressing why not take a look at these cards and use the method of See, Judge, Act to come up with a solution?